The 1841-O Coronet Eagle was the rarest $10 gold coin prior to 1859. Production of the $10 gold eagle resumed in 1838. The Liberty Head, often called Coronet Head, was employed as the motif. It wasn’t until 1841 that the New Orleans Mint began striking $10 gold eagles, turning out a paltry 2,500 pieces, making it the rarest Coronet Eagle coin in the entire series prior to 1859. The rigors of time caused most of the 1841-O Coronet Eagle gold coins to disappear. No more than 60 exist today. Collectors understand the true scarcity of the 1841-O, although for long stretches of time, the coin has stayed out of the limelight (see chart below). In the recent years, however, the 1841-O has gained the respect it deserves, a scenario not likely to reverse itself any time in the foreseeable future. 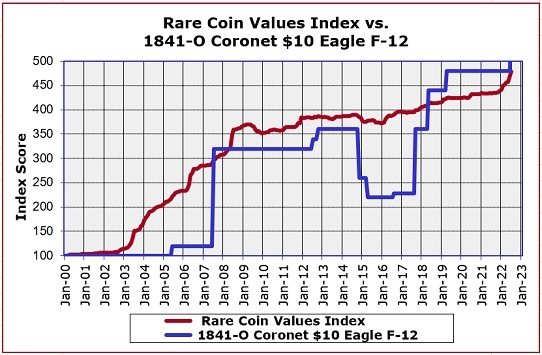 The percent value increase since Jan 2000 of the 1841-O Coronet $10 Eagle in F-12 condition is charted by the blue line above. The 1841-O flatlined for many years, then all of a sudden, as if a corrective response to the truly rare nature of the coin, its value exploded, rightfully assuming its proper status. The red line measures the performance over the same time period of our Rare Coin Values Index, which takes the composite percent change of a representational group of 87 rare US coins. The Index was created to get a feel for the strength and direction of the overall rare US coin market. The 1841-O Coronet Eagle is one of the 87 coins included in the Index. The Index is updated monthly.